A literature review on suitable and effective approaches that inform and support programs for pro-poor rural development in Eastern Indonesia was initially conducted. Following a workshop in Indonesia of F2F practitioners and researchers, a set of principles, recommendations and examples of F2F learning activities that could be used by field staff and management were developed. The principles were adopted in a mango farmer expos pilot in late 2014. This report outlines the theory and principles of F2F learning. Various approaches of F2F learning are discussed, with particular reference to the Farmer Field School as one of the commonly implemented and widely adapted approaches. Various delivery platforms for F2F learning are detailed, including Government, NGO and private sector. The report also includes a discussion of the benefits, costs and sustainability of F2F learning. This document is a workshop summary drawing together the findings from the F2F literature review and key points from presentations by F2F practitioners and facilitated discussion sessions. Included in the summary is a brief overview of F2F theory, principles and models and case studies of F2F learning that show the greatest promise in contributing to AIP-PRISMA’s (PDF 344 KB) goals. The summary concludes with key principles for successful F2F programs. This report and PowerPoint presentation outlines the key design principles underlying successful F2F approaches. It includes material on levels of participation and adult learning principles, and diagrammatical representation of the phases in the F2F process. Scaling out and scaling up issues are canvassed, as are some techniques for F2F delivery. It concludes with information on three methods of F2F – cross visits, farmer-led methods demonstration and farmer-led results demonstration. The mango pilot involved using adult learning principles to assist Syngenta technical advisors and collectors in developing effective expos to promote early season flowering. A number of PowerPoint presentations were prepared for the mango pilot. The first outlines the key design principles of F2F (see F2F Design Principles presentation) and how to plan an effective mango expo. It addresses issues such as principles for effective F2F expos, identifying stakeholders and target audiences, selecting attendees, defining the purpose and objective of the expo, relevance checking, establishing activities to achieve the objective(s) and evaluation. The pilot method demonstration presentation presents information on how to effectively set up a method demonstration. It canvasses identifying the purpose and target audience, developing outcome-based objectives and a demonstration plan, a check-back on process to achieve outcomes, pre- and post-demonstration tasks phase guide the planning of this phase. Target audience is identified, along with guidelines for the development of the demonstration and pre- and post-demonstration tasks, including evaluation. 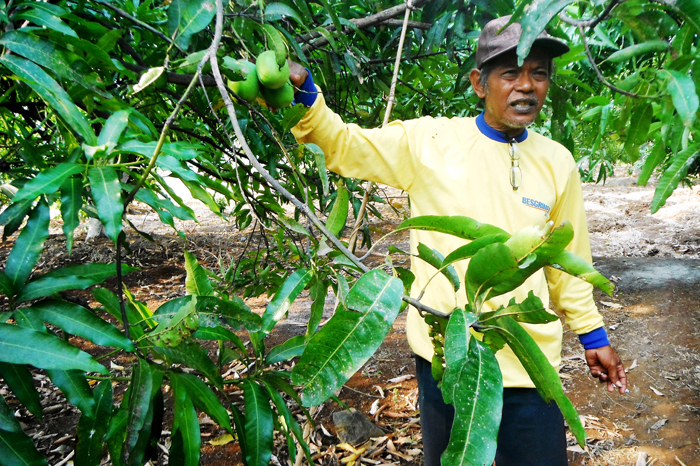 Mango farmer, group leader, Cirebon, West Java.